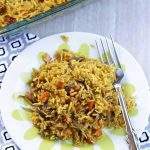 Biriyani is one of the most daunting recipes for me to cook. 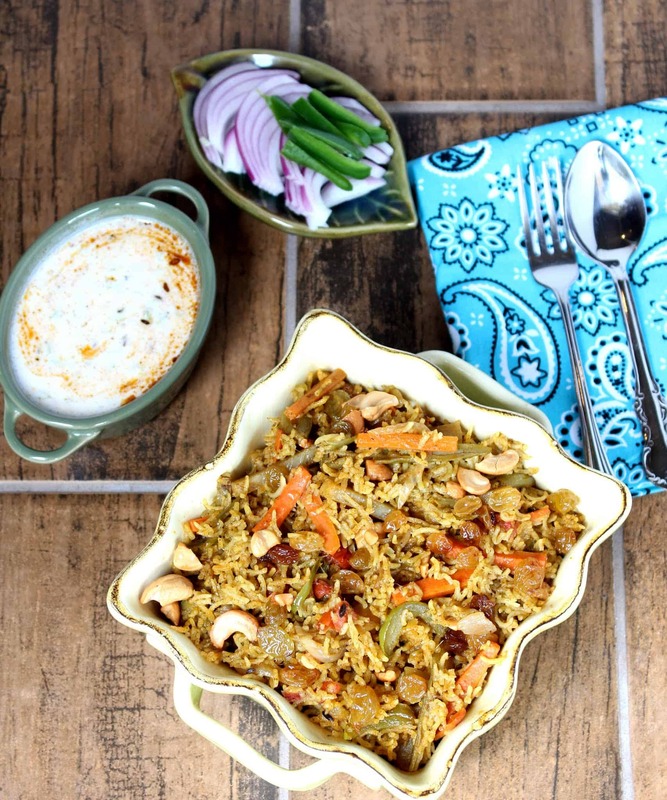 I always make the biriyani as a weekend lunch when I have more time to make it. I have always used fresh spices in the past and never even realized that there is a Biriyani Masala powder available in the stores until one of my friend who is moving away gave me her box of Biriyani Masala. That is when I thought of making the quick Simple Cabbage Biriyani | Spiced Cabbage Rice for dinner. When it comes to making one pot meals. 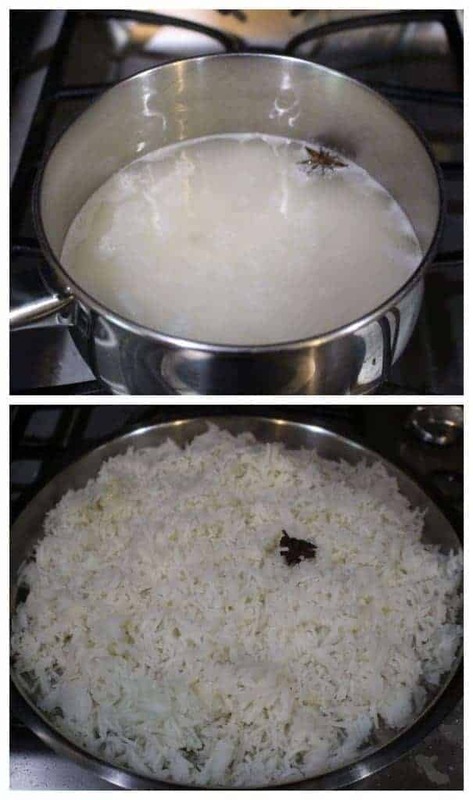 rice is the best choice. The options are just unlimited to make with rice. 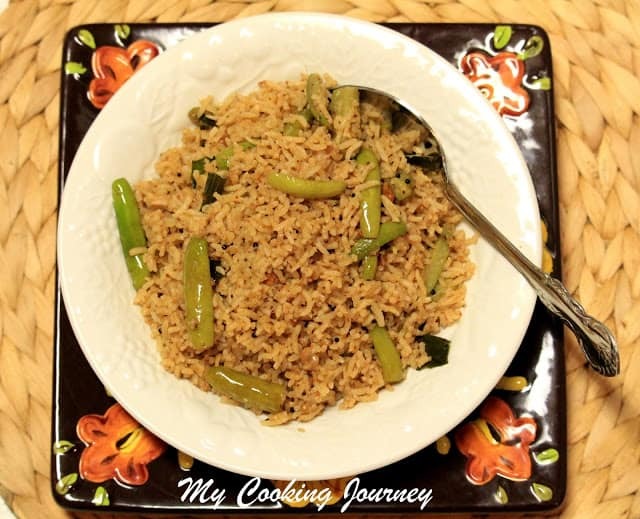 One pot rice recipes are very popular at our house and I make it at least once a week. 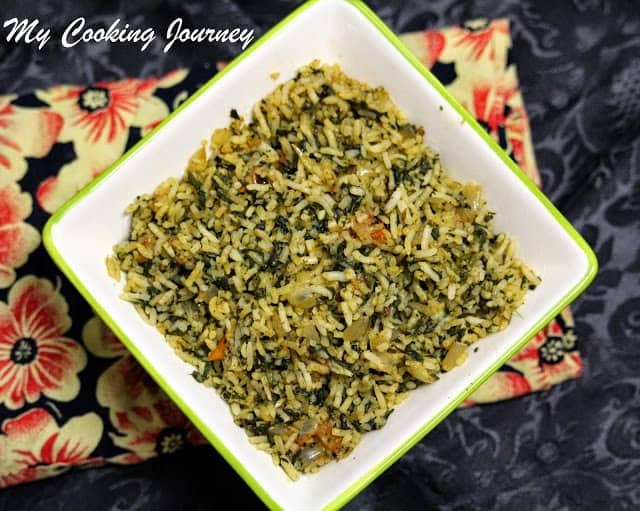 One of the very favorite rice recipes of my little one is this Spinach rice. I also have another version of Spinach rice with peas that I make often. When I was all set to make Biriyani with the masala powder, that is when I realized I did not have many many vegetables. It was just the end of school year and things were too busy. All I had was some cabbage and bell pepper in the refrigerator and hence thought why don’t I make Biriyani out of just these two vegetables. I love the crunchiness of cabbage in fried rice and hence thought this would be a great choice. The one pot Biriyani, I have made in the past is still a simple recipe, but I have made freshly ground masala paste. 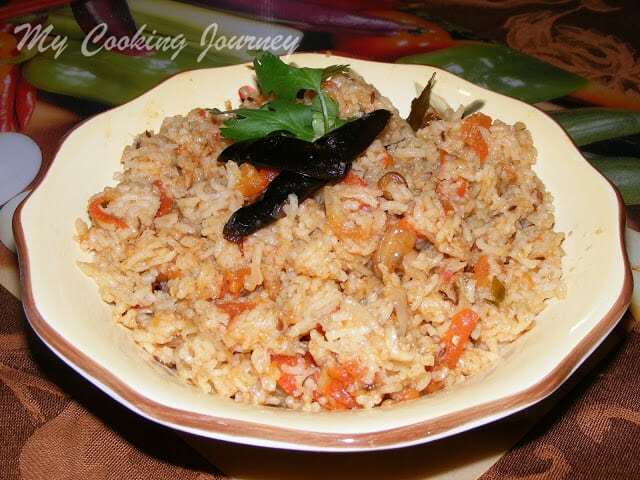 Using the biriyani masala is definitely the easy way out without compromising on the flavors. I am sure I will be using the store bought Biriyani masala is a little too often from now on. Cook the rice with a star anise and 1/2 tsp of salt and keep aside to cool. I cooked my rice on stove top in a sauce pan. Wash and soak the rice for about 20 minutes. Add a star anise to about 2 cups of water and bring it to a boil. Add the drained rice along with salt to the boiling water and mix. Let it come to a quick boil and then simmer until all the water is absorbed the rice is cooked. Cover the rice and let it finish cooking. Turn off the flame when the rice water is all gone. 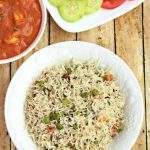 Let the rice stand for few minutes and then spread it in a wide bowl or tray to cool. In a pan, heat the oil or ghee. Add the fennel seeds and cardamom and let it fry for couple of minutes. Add the sliced onions and let it saute until translucent. Now add the bell pepper and the cabbage and mix well. Also add the chopped mint and let it all cook until the cabbage and the bell pepper are 3/4th cooked. Make sure that the cabbage and the pepper still maintain some crunch to it. Now add all the dry masala powders; turmeric powder, red chili powder, dhania jeera powder and biriyani masala along with salt needed. Mix well and add the yogurt. Saute until the oil starts to separate and the mixture becomes aromatic. It takes about 5 to 7 minutes in medium flame. 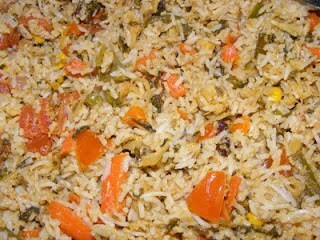 Add the cooked and cooled rice to the vegetable mixture and gently mix. Take care that we don’t break the rice. Cover the pan for 4 to 5 minutes and simmer. Turn off the heat and serve hot with raita. 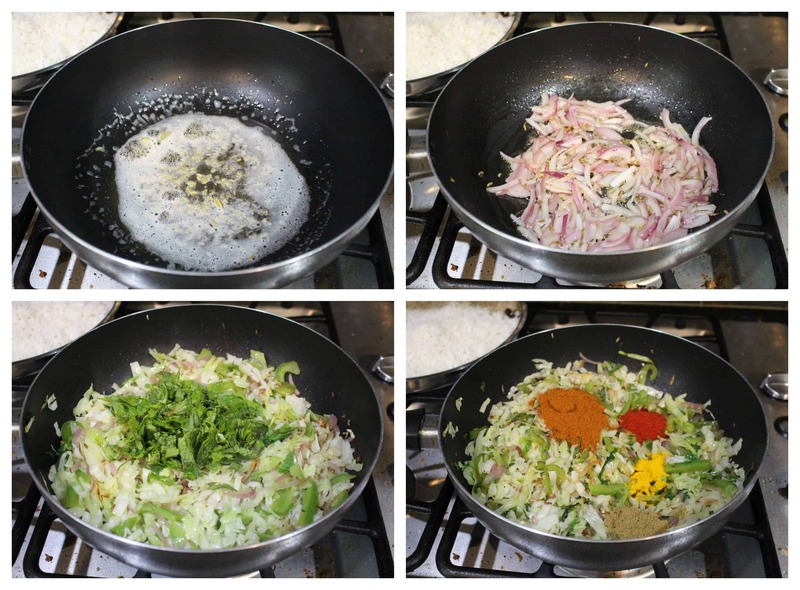 Add the cooked and cooled rice to the vegetable mixture and gently mix. Take care that we don't break the rice. Cover the pan for 4 to 5 minutes and simmer. 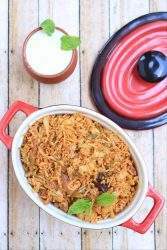 Very flavoursome rice, I always have some at least 2 different biryani spice mix handy..love the use of cabbage here..very nice dish to enjoy! How delicious and flavourful this rice will be. 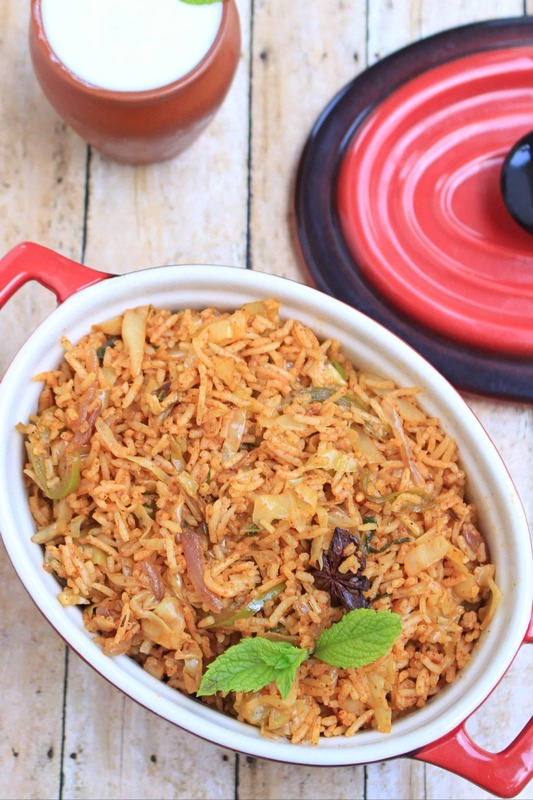 Simply irresistible and inviting cabbage rice. I would like to make this sort to carry in my lunch box. Masala packets are so convenient to speed up the cooking process. The cabbage rice looks fabulous. Ummm just a cabbage biryani, that’s an interesting one pot meal. Have to try it. I too use freshly ground spices and have not used ready made biryani masala. Perhaps I should as these days ready made spice blends too are very flavorful. 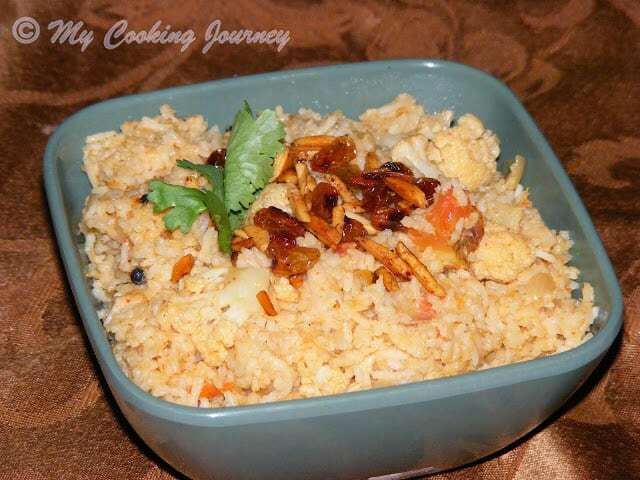 Using biryani masala makes life easier. The biryani looks awesome Sandhya and as usual nice presentation..
Why didn’t I see your recipe the day as a cabbage was lying in my fridge too and no one wanted to eat it. So I gave it to my maid. 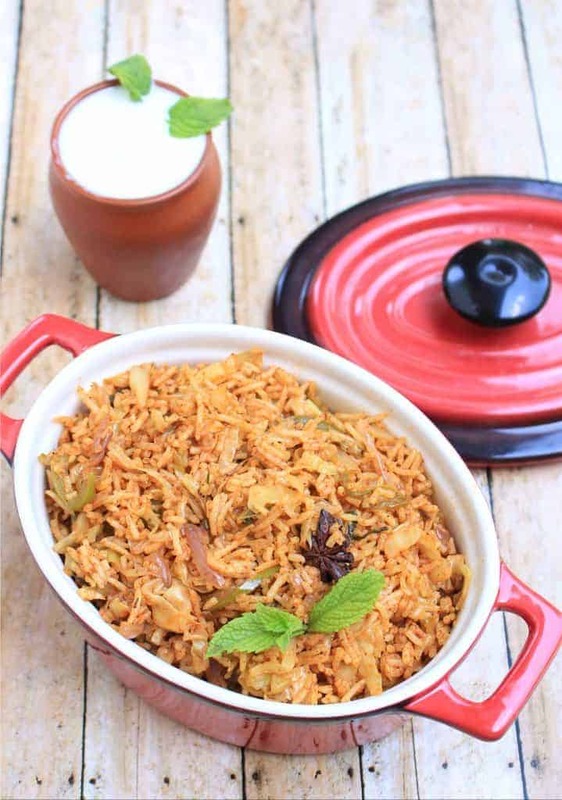 Now this flavorful spicy cabbage biryani is tempting me to the point that I need to make it asap. 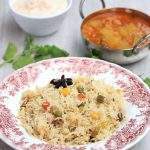 Wow.. love the flavors and process of biryani.. never tried cabbage in biryani… bookmarked. A very flavourful Biryani indeed..love this version with Cabbage. Bookmarked. Cabbage is one of my favorite veggie and I can’t get enough of it! I make rice with this in another method. Am surely going to try your version and pack it off in the kids lunch box. The rice really looks so inviting Sandhya!